Bayside Villa Pineapple pants. It takes 12 to 18 months to produce a single Pineapple fruit. The fruit grows on a stalk after the purple flower appears. When 1/4 of the fruit starts to turn yellow its ready to pick and eat. There is an easy way to propagate the pineapple. Go to the store and buy a pineapple with a good looking green top. Twist off the green top, then cut any remaining fruit pulp from the top you just removed. Next peel back and remove the bottom leaves of the top to expose about 1" of the stock, you will see small roots. Let dry in cool spot for 1 day then suspend in water so roots are wet but the rest of the plant remains dry. Do not place in direct sun, but near source of sunlight. 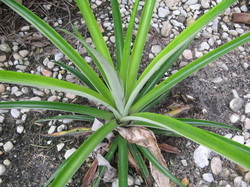 The pineapple top will develop roots in a week after which in can be planted in soil inside, or outside if you leave in tropical southwest Florida. 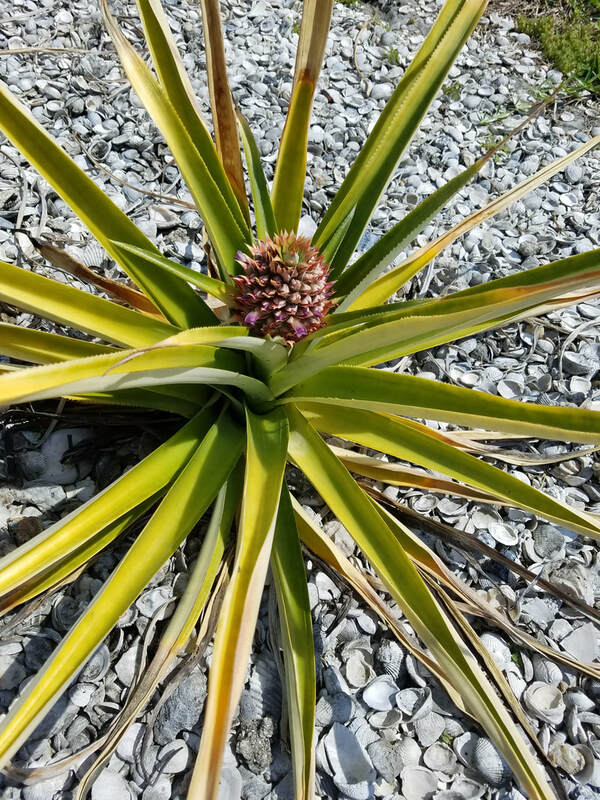 In about 18 months you will have a delicious pineapple. 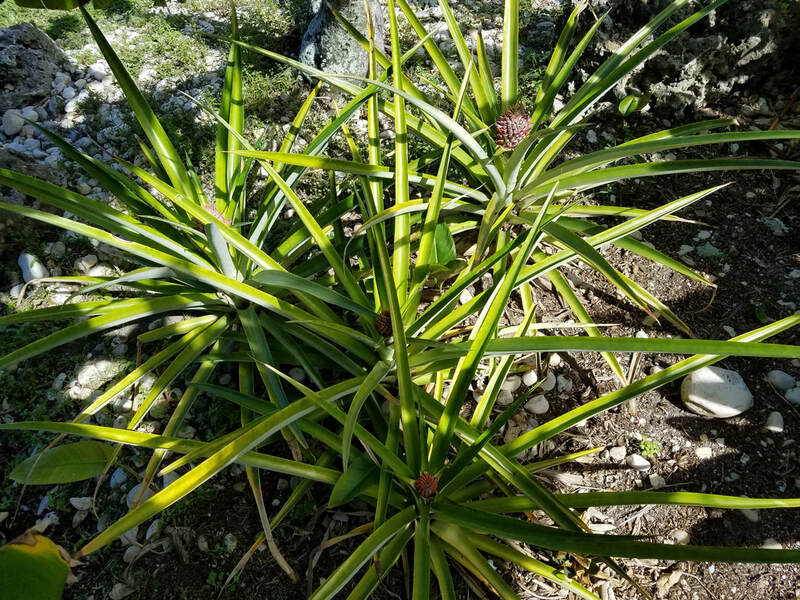 Cut it from the plant but leave the plant in the ground it will produce another pineapple the following year. About two pineapple is all you can expect so its best to plant additional pineapple. Although recently I had several pineapple plants that had not fruited in nearly 3 years bloom and set fruit. 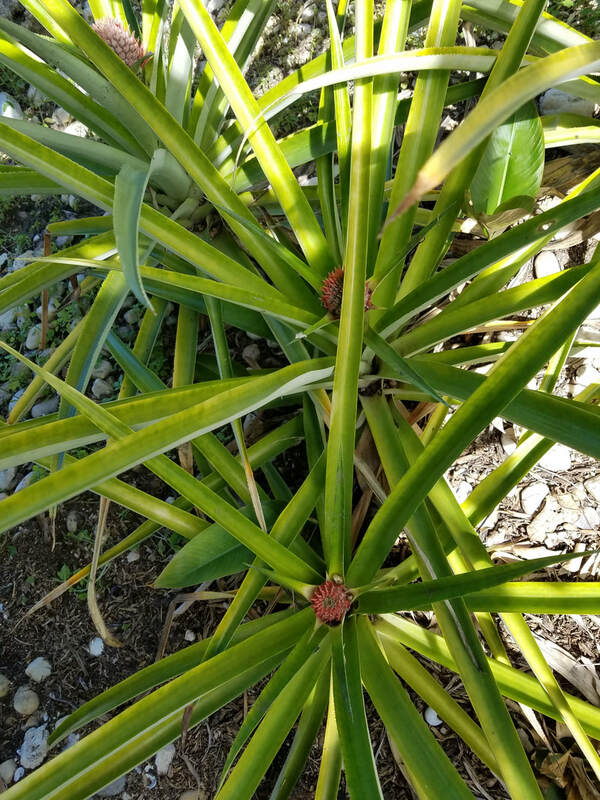 Recently in March of 2019 I had 5 different pineapple all bloom and set fruit at the same time. What I found odd about this is several of these plants had already borne two fruit over a number of years and one was about a year old. Somehow they all developed that beautiful purple flower and set fruit. I guess there is still a lot to learn about the pineapple. They pick them pretty green when they send them to market. A plant ripened Pineapple is a treat.